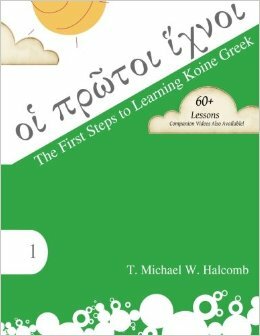 The Blog of Dr. T. Michael W. Halcomb: New Book: "The First Steps to Learning Koine Greek"
New Book: "The First Steps to Learning Koine Greek"
I am pleased to share with you today, the news that my newest book τὰ πρῶτα ἴχνη: The First Steps to Learning Koine Greek is now available. This book also has over 60 companion videos, which is essentially one companion video per lesson in the book. This is a great resource for those just getting into Greek, especially youngsters. Homeschoolers and lower schools teaching ancient languages will find this to be a fruitful resource alike. You can see a few samples below and can purchase the book HERE or HERE. My New Book: "Give Me That Book"